Welcome to our 41st episode in our podcast series that’s about investing in tax-delinquent real estate as well as real estate investing in general. In our REI business, we focus on properties where the owners have not paid the property taxes. As a husband and wife investing team, we’ve done nearly 3,500 deals – in land and houses – with little competition and big profits. And we’re sharing what we know with you. 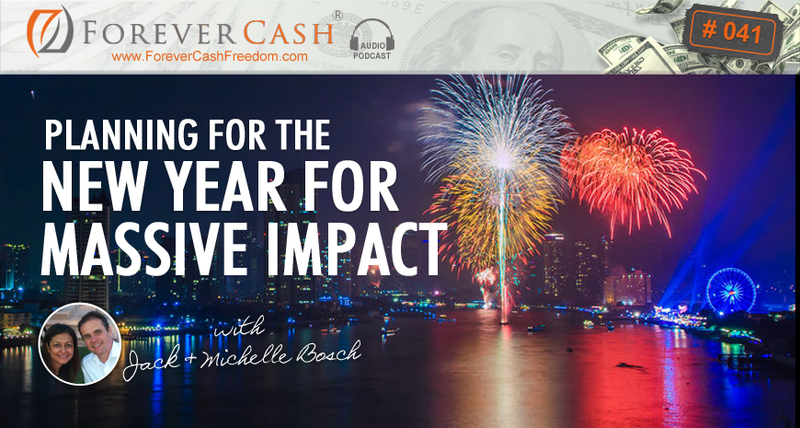 Today’s episode is all about ringing in the New Year in a great way by setting goals for 2016 the right way. Through our structured framework, we’ll explain how you can plan for the new year in such a way that will create massive impact for 2016 and beyond. It’s all about consciously designing your year, being deliberate and having intention for the year with a structured plan. And we’ll explain exactly how to do it. Jack: And Jack Bosch speaking here. Michelle: Yay! I got to go first. Michelle: I guess he figured he gives me one last chance to be able to start the podcast. Jack: …To actually let you go and get started many more times in the New Year. Michelle: Awesome. Well, that’s good because the topic of today’s podcast is New Year’s resolutions, and more specifically goal setting for 2016 that is coming up really quick, really fast. And so if you are new to our podcast, our podcast is about tax delinquent real estate investing. Michelle: We do not attend auctions. We circumvent the auctions. Jack: Let me jump in there for just a moment. Jack: We haven’t really talked about that for a little bit. This podcast, Michelle will be sharing most of the things because she’s the structured one of the two of us. She’s the one that actually follows rules. She’s the one that actually keeps me in line and have… I learned to appreciate the importance of having or doing what we are going to talk about in this podcast. It’s really a very, very important. Michelle: Yeah and not structuring in a limiting way. Just think about you’re thirsty. And there’s this huge body of water. And how are you going to get that water into your mouth. You can either cup your hands, which works just fine, but the cupping of your hands has just created structure for the water to be held in order for you to drink the water. Michelle: So it’s really just… Don’t think of it as structuring in a limiting way, but think about it in the way of it’s the framework that allows me and that ensures certain behaviors, certain activities, certain things to happen and that holds certain of my desires, of my deep yearnings that I have for my year, for my life, and that’s what structure is really. Michelle: We have about 16,000. Jack: Jamaica, Italy, you name it. And what our specialty is to go after properties where the owners have stopped paying their property taxes. Now typically, what people mention if I say that, they say, “Oh, about tax liens and tax deeds? Yes and no.” Tax liens and tax deeds are the methods that the United States government entities, the counties and states use to flush properties where the owners haven’t paid their property taxes through the system. What we have done though is we have… Well, we do invest in tax liens and tax deeds and we can show… Again, if you go to ForeverCash.com/Freedom you can get access to different kind of courses on that subject. But all what we have done is we really taken it one step further and we have figured out a way that we don’t have to attend these auctions, that we don’t have to deal with the competition and the time waiting requirements especially in the lien world. But we figured out a way that we can buy properties that the owners no longer want, that usually have a 100% equity in them, that we can get directly from the owners with title insurance literally for anywhere between $0.05 and $0.25 on the dollar. That’s what we figured out, and then we turn these around, turn it around, and sell them for 50, 70, or even 100% of market value in some cases, making our money back tenfold in a matter of just a few days or a few weeks. And this is the technique that we show you when you go to ForeverCash.com/Freedom. That is the first few podcasts of our podcasts were about that, and then we go into more and more detail. Today though, since it’s the end of the year, we want to talk about yearly planning. We want to talk about structures. We want to talk about a way that you can plan for the new year in a way that you have massive, massive impact in that year. And with that, I’m going to hand it over to Michelle right now for you to lay the lay of the land. Michelle: Okay, wonderful. So yes, so it’s the perfect time. Everyone is thinking about this… about what the New Year is going to bring. There’s a lot of momentum. There’s a lot of energy being put into this. And it’s a wonderful time to basically ride that momentum along and start thinking ourselves about how to consciously design the year that is coming up. And for many of us, the design or conscious is perhaps something new. Maybe it isn’t. But it is basically being deliberate and having intention for the year that is about to start versus just coasting through it. And in that context, like Jack said, there is a tremendous benefit in thinking about some kind of a structure, some kind of a framework. Like I was making the analogy earlier, that if there’s something that holds the water, it will be easier for you to drink the water if you’re out somewhere in the forest. And all of a sudden you come and there’s a lake and you want to drink water and you have no utensils. Well, a cup or a glass would give you that framework or that structure in order to make it very easy or cupping your hands would give you the structure to make it very easy to drink without having to necessarily get into the water and submerge your head in the water in order to have a drink of the water, and so on and so forth. So yeah, I want to start with that conscious design in mind and I want to think about, I want us to think about basically going on a journey where we look out three, five, ten years depending on how used you are to a longer time horizon. For many of us, at least when we started, Jack and me could only see the month ahead of us. And eventually we train ourselves to see the quarter ahead of us, the year ahead of us, three years out, five years out, 10 years out, and eventually what are our lifetime goals many more than just 10 years out. And so, if you start with that in mind and basically putting yourself out there in the future looking back, and you think about what needs to happen for me to feel like I’ve had a life well lived that it’s been an amazing ride, what are some top three, five things that needed to have happened in your life? Because at the end of the day, we always think that more and more is going to bring happiness and fulfillment. But there are a few things that really bring us fulfillment. And so we think about them in terms of maybe top five things that when we look back, it’s going to be a life well-lived; I think that is sufficient. And so I would say that you start with that outlook very way out there in the future, and think about those five things in terms of perhaps financial, in terms of health and fitness, in terms of relationships, maybe in terms of career growth or maybe in terms of character and spiritual growth, or perhaps maybe in just leisure time to do things that you love to do. It doesn’t have to be something extremely tangible. And so think about those five things, and then once you’ve thought about those five things, go ahead, Jack. Michelle: Life will sabotage the business. Jack: Life will come in and life will show you that there are other parts to your life than just business. Michelle: It’s not holistic also. It’s a very fragmented way to think about your life. Michelle: Health is your first wealth. Jack: Exactly, health is your first wealth. Then by addressing health, you’re moving your business goal forward. If your family, if you have kind of let’s say a situation of your family that doesn’t allow you to fully give everything to your business, if you focus on your family and bring your family to a better place, then it helps you drive your business forward. So that, I just want to bring it into context that you want to start in not just a five-year goal as Michelle said. Or no, as a five year goal because a five- or 10-year goal allows you to look at the bigger picture. Jack: And also by using more than business pieces, it allows you to put a holistic all-encompassing strategy in place that will ultimately make it much more likely that your business even succeeds. Michelle: Absolutely. So once you have that outlook, whether you want to start with three, five, ten or even lifetime goals in those five areas, you want to then think about, “Okay, so how can I start living or how can I start chipping away at those five goals in 2016?” And that’s where your annual plan will come from. It will come from that longer-term horizon type of goal versus just looking at the year ahead without looking at it in contrast or in context of a bigger lifetime, for lack of a better word. And so the year is a formidable time to think about those lifetime goals. And like I said, if a lifetime goal is too long, then just think about it three-year goals and out of those three-year goals, let me think about, “What am I going to start working on in 2016?” which will be year one of those three. And so going back to the year, so the year is a natural rhythm. It’s the time of the year or the time that it takes for the earth to go around the sun, 365 days. And the next level down would be to think about your goals in terms of the quarter, basically 90-day goals. 90-day goals are not a natural rhythm, but they’re a formidable time frame to basically goals that seem monumental to break them down basically into smaller chunks that are more digestible, easier. And the 90 days is short enough such that the entire year hasn’t passed without you moving. Or if you have been in a busy movement, for you to basically rechannel and refocus your energies. So it’s not too long but it’s not too short. So then the next level down would be the month and then the next level down would be the week. So let’s go back to the annual then. And the annual, we usually… with Jack, we always want to think when we’re looking at the year as to, “What could the theme of this year be?” So we have these lifetime goals, and this year is going to be about whether it will be constant forward motion. Those have been some things that have been our themes in the past. Michelle: Or discipline has been in the past or transformation of our perception, of our new normal, of our perspective, of our outlook. So transformation was a year, was a theme that we have chosen in the past. And it’s just basically, it gives a little bit more intention and more character to those five yearly goals that you’re about to embark on and identify and choose, because it’s very important to really think about the goals that you’re deciding to go after. You want to choose goals that are already leveraging what you have going. We all have limited time and limited energy. And so if you go after a goal that does not leverage any of the things that builds upon certain things that you already have, maybe it’s not the best and most effective use of your time over the next year. So think about that when you’re identifying those five yearly goals. So when you go down to the quarter, you want to think about 90 days. And basically you have four attempts during the year where you can say the first quarter of the year is going to be about perhaps giving momentum to my goal of health and fitness or giving momentum to my finances. And you can make the first quarter of the year about that, or you can think about two such goals and make those the momentum, the emphasis of a particular quarter for example. Michelle: Or three actions basically that will move the needle most. Jack: …If that’s what you do in order to get the thing going. Or if your goal is personal asset allocation, which basically means starting to take the money that you make and converting it into forever cash ideally, then the first quarter of action would be to establish perhaps the relationships that you need in certain markets in order to get the lead flow going. Jack: …If I remember it right, and Michelle is more of the expert of that than I am. And basically goals of certain business goals. So we asked ourselves, “What is preventing us from reaching these goals even if we put the plans together? What’s going to prevent us from fulfilling these quarterly goals?” And the answer was always… Well, we just got to have the self-discipline to do two actions a day, to do three things or five things a week, to do those pieces. So no matter what it was, it was like… It’s that they say the hardest part of going to the gym is getting there. Jack: It’s getting up and going there. It’s a self-discipline part. So we identified that it’s self-discipline. If we spent a year doing things that helps us get better and better at the self-discipline part, then all the other pieces will fall into place. Michelle: Yeah. So it was like… that basically added intention to that theme of the self-discipline added the intention to each and every one of these quarterly, monthly, and weekly goals that we had set for ourselves. And so in order to wholesale 10 deals a month or 30 deals in a quarter, that means that you need to be having X amount of lists from X amount of counties that you need to decide on how many letters I need to be mailing out on a monthly basis, weekly basis and pre-scheduled, and your list has been already pre-sorted for those four weeks out in preparation for the plan, for the month. And that will ensure that I will have the possibility to make X amount of offers. And with those X amount of offers, I can guarantee that every month I will have, ten deals for me to basically either flip, or flip and fix, or whatever it is that your exit strategy is going to be. So the month really brings it much, much closer. It’s 30 days, but it’s still again another four chances to think about how to break those goals because your each month has four weeks obviously. And once you get to the week, this is where this whole goal setting usually falls apart, because in the week and in the day is when life happens: when we get sick, when so and so had a car accident, when… I don’t know, something else broke down. And so here when you come down to the week is when you want to start thinking about efficiencies in terms of your time and the activities that you’re getting devoted to. And start chunking your time up, where you say, “Okay, at the week level, I’m going to work on maybe acquiring lists every Monday. I’m going to work on filtering lists and prescheduling my mailings out every Tuesdays. I’m going to be making offers on Wednesdays, and then I will be doing at least a couple of hours of marketing in terms of the sale of my properties everyday of the week because that is a focus activity that generates revenue for you. And so this at the week level is where… when the action really begins, when the action really starts, and when you get to the daily level is when things and habits, like for example when we identify that self-discipline needed to be a key intention behind everything we did is at the daily levels when you’re going to see and recognize that even if you had these wonderful lifetime goals, this great annual plan, this great quarterly plan, monthly plan, weekly plan, that when it comes to the day, that in the day is where everything blows up, and things don’t happen like they should be happening is where you have to also set a little bit of structure for your day in terms of you want to start your day with a certain intention. You want to know what that day is going to be about, like if you’ve chunked your time, Tuesdays and Thursdays of your week are going to be devoted to X, then you don’t wake up aimless. You know what you’re going to be doing. And so the day is also a wonderful time to set in a structure maybe for gratitude, for giving thanks because we’re always looking at… and this whole thing of goal setting is always projecting yourself out into the future, but it’s never looking at, “Wow, looking back and seeing at how far you’ve come,” yeah? So maybe in the day is where you have… where you want to put a little bit of structure around making a commitment to being grateful. Or maybe a commitment to set a little bit of time in the morning for yourself. Tony Robbins calls this the ‘Hour of Power’ where you basically do whatever it is, whether it would be a cup coffee… enjoying a cup of coffee, maybe five or 10 minutes of reading or maybe prayer or meditation to really feel powerful about your day and go about your day completely integrated. Versus waking up, snoozing three times, and all of a sudden you’re in panic mode, and you basically have chosen to not be powerful and instead to be fragmented, and that day to basically slip out of your hands and go downhill in terms of how the quality of a day could have been. So that’s kind of like… And then I’ll show what we usually go through during the year… at the end of the year. Jack: And then from that, then if we have what needs to happen in the next year, how are we going to group that into quarterly goals? Jack: “In the next week, I got to be working mainly on Y, and the next month we got to be working mainly on Z.” And what you basically do is on the weekly basis, you now sit down. And usually I like to do it Friday mornings already. I used to do it Sundays. Now I’m doing Friday morning because I actually even have a meeting Friday mornings with an accountability partner that holds me to it, and I have to be ready on Friday morning. And that’s actually has been very helpful, because now instead of dragging it into the weekend, and then Sunday night realizing…. Jack: …And looking at which days and which time blocks are perfect for it. Jack: Now all of that happens within the framework of what I need to get done in that month, what I need to get done in that quarter, what we need to get done in that year. So therefore, it’s purposeful driving your life forward in different aspects and creating a big impact year. All right. Michelle: Absolutely. And if you’re thinking about… because I know for most of us the financial category is very important; it’s of key focus. Think about these timeframes of the annual, the quarter, the monthly, the weekly goals not just a number of deals, but a number in terms of cash flow. “What type of activities am I needing to be working on in order to produce X amount of cash flow either for one-time cash or just passive cash flow? What is it that is going to sustain? That is going to create…? What activities are going to create predictable amounts of cash flow of X amount, whatever that amount for you is on a quarterly, monthly, weekly basis, and so on? Jack: Absolutely. All right, so with that, I hope that was helpful. You might want to listen to this podcast a couple of times because there Michelle mentioned a lot of really good gems. And then go ahead, have a wonderful, wonderful rest of the year. If you’re listening to this… Obviously if it’s on a podcast, it can be listened to any time. But if you’re subscribing to our podcast, you probably was downloading it right when it came out which is the end of the year. So we’re wishing you a great end of the year. And then going forward, plan your year out. If you’re listening to this in the middle of the year, it doesn’t matter. Plan the next six months out or go for that right away. If anything that we just mentioned had kind of like an epiphany effect or had… which it had to me, as a naturally more quickstart person that wants to have his hands and fingers in a whole bunch of different businesses and things like that. Or I have tons of ideas that I want to all implement at the same time, that was tremendously helpful to me. And since we’re implementing it in, our life and our business has been much better. So therefore, whichever way you are listened to that, go implement it; go start it. Michelle: Even if it’s like not perfectly positioned to be like the beginning or the ending of a quarter or whatever, just think of a 90-day sprint. If you’re halfway through a quarter or the year or wherever it is that you listen to this podcast, think about a 90-day sprint, and from there think about your month, think about your week and basically go about it with intention, with conscious design and a little bit of structure or framework that will basically ensure that certain things happen in the time frame that you want them to happen. Jack: Absolutely, so with that, again if you liked us, go to iTunes.com; search for Forever Cash. Our podcast comes right up along also with our audio books and other things. But go to the podcast. Ideally, leave us some feedback. Well ideally, the more stars, the better. Not just press the five star button, but also leave us… tell us what you did enjoy about it. And we will love to hear from you. Again as always, your free gift is at ForeverCash.com/Freedom. The podcast notes are on ForeverCash.com/Podcast. The transcriptions and your ability to actually… go click on the podcast link on the ForeverCash.com/Podcast. And go to the bottom of it and add your comment to it. We want to hear from you about these podcasts, right? So with that, we say thank you and see you next week.